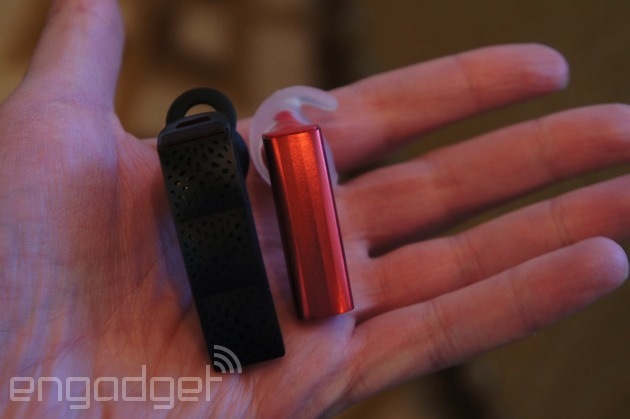 Wearables may have been the talk of the town at CES, but given that Jawbone just released the Up24 a month ago, chances were slim it was going to announce another fitness tracker so soon. Instead, then, the company is going back to its roots: It just announced a new version of its Era Bluetooth headset, with a markedly smaller design, a 10-hour battery and a bundled charging case. In particular, the new Era is 42 percent more compact than the last-gen model (see the comparison pic after the break), with a new earpiece that's said to fit more securely. On the audio front, Jawbone moved to tiny MEMS microphones and also overhauled its Noise Assassin noise cancellation technology with support for wider-band audio. You can also use voice commands to order Siri around, assuming you have an iDevice. It's on sale today in four colors starting at $100, though if you want that charging case, you'll need to shell out $130 for the bundle.